One of the Flash’s most iconic allies, Ralph Dibny — a.k.a. 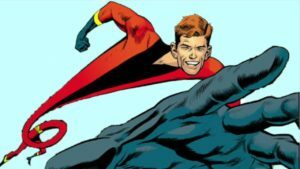 The Elongated Man — is a fast-talking private investigator with investigative skills that rival those of Batman. 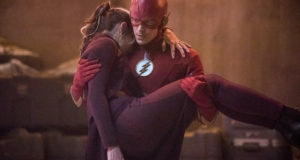 Upon discovering he has the power to stretch his body to any shape or form, Dibny uses his new abilities to help Team Flash solve one of Central City’s greatest mysteries. Hartley Sawyer is represented by Pakula/King & Associates. 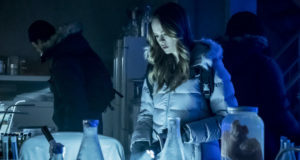 He was most recently seen in the CW Seed’s Saving the Human Race along with Anna Akana’s Miss 2059 for go90 (currently shooting season two). Previous work includes ABC’s Don’t Trust the B in Apt. 23, the TBS comedy Glory Daze and GCB with Kristin Chenoweth on ABC, as well as the critically-acclaimed short SPiN, Caper from Amy Berg and Felicia Day. And, as you can see to your left, he looks decent without a shirt on. The Flash Season 4 premieres Tuesday, October 10 on The CW. Follow @FlashTVNews on Twitter for Season 4 updates as they become available! Previous: Photos: The Flash Cast At Comic-Con 2017! Next: The Flash Season 4 Costume Revealed?